If you own an HTPC, you are lucky, because HTPC is a powerful movie watching implementor and a resource storage device. HTPC is the combination of personal computer and home theater. It refers to a device partially or wholly combining the capabilities of PC with a software application that can play back video, photo, and music, etc. HTPC is a personal computer preloaded with various multimedia decoding players, capable of playing varied audio-visual media correspondingly and connecting to all kinds of display devices like digital audio devices, for example, TV, projector, PDP (Plasma Panel Display), and audio amplifier at the existence of corresponding interfaces. Watch Videos on HTPC, or iPad iPhone? If you already have HTPC, you probably also have a good deal of amazing videos and music. It is a pity if these resources cannot be used properly, for example, if you are often away from home on business trips. HTPC provides large screen, surround sound, comfortable seat, high video quality as well as abundant audio/video resource for your watching videos or enjoying movies. However, watching videos on iPad iPhone is more portable and flexible. It is more applicable in case of business trip or commuting. What if your iPad iPhone can be taken as an HTPC video player so that you can watch videos on iPad iPhone anywhere? Definitely, it is possible! That is to say, if your job makes you on the go, you can also make your videos on the go – streaming HTPC video to your iPad iPhone such that you can watch videos on iPad iPhone. 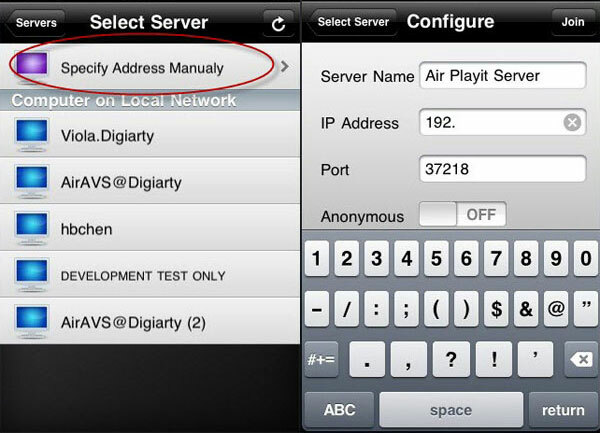 Taking streaming video from HTPC to iPad iPhone for instance, with professional video/audio streaming software, you can easily duplicate your home video library on your iPhone iPad over WiFi/3G/4G. Although Apple product is always strict with video format and only accepts specified formats such as MPEG4 and H.264, all the videos and music in your home theater library can be streamed to your iPad iPhone with Air Playit with 320 built-in video/audio codecs. Thereby, you can play movie or music on your iPhone iPad anywhere both at home and away from home. 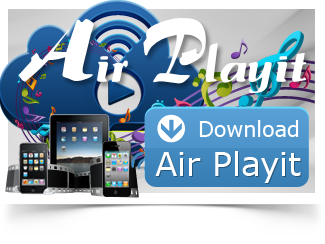 Download Air Playit App Client and install it on your iPad or iPhone. Step 1: Run Air Playit Server and add any videos, movies or music from your HTPC to "Shared Folder". 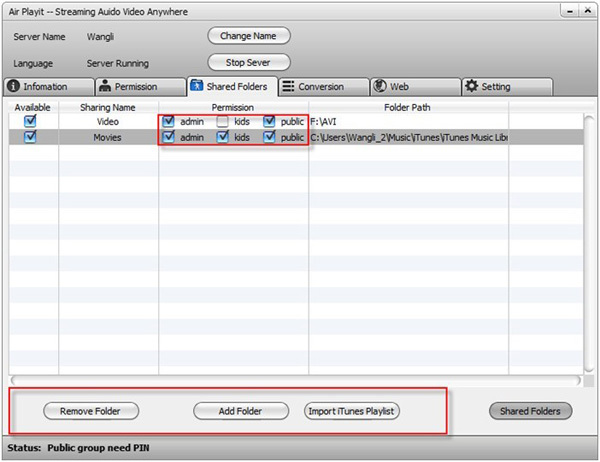 You can also set the permission for watching videos on iPhone iPad as admin, kids or public. Step 2: Run App Client on your iPad iPhone and add your server. This app can automatically discover the local network by Bonjour Server. If Bonjour connection information cannot be found, specify the IP address by yourself as follows or close the firewall for a try. Step 3: Browse the folders under the server and choose the video you need, simply click "Play" to watch video on iPad iPhone via Wifi, 3G or 4G wireless Network.